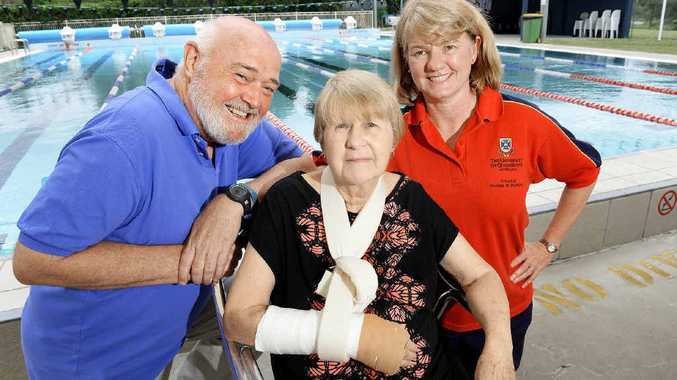 AN INNOVATIVE swimming program run in conjunction with the Ipswich Hospital Foundation is set to improve the lives of people with dementia. Researchers from The University of Queensland's school of nursing and midwifery and the Ipswich Hospital Foundation are collaborating with the Watermemories Swimming Club (WSC) project. The project aims to rekindle positive memories of swimming in people with dementia who enjoyed swimming in their lives. The University of Queensland's WSC project manager Angelique Zamora said the program was all about improving the quality of life of people with dementia. She said swimming had many benefits. "It can help with sleep and appetite," she said. "When energy is burned during swimming it encourages them to sleep better and eat better. "It is also good with pain because it is a non-weight-bearing exercise and it encourages joint mobility and a full range of muscle movement. "It enhances strength as well." Swimming also can result in sufferers falling less. "It improves their balance, and it is vital for aged people to not have falls," Ms Zamora said. "Their mortality rate increases when they have falls. "It relaxes and reduces the tension in them and decreases the behavioural and psychological symptoms of dementia...such as depression and aggression. "Their endorphins in the body, the happy hormones, are released during exercise. "The benefits are both physical and psychological." Ipswich Hospital Foundation executive officer Tom Yates said the Watermemories project was another way the foundation continued to support health and medical research in the West Moreton area. "We hope supporting this project will also bring us one step closer to achieving our goal of becoming the healthiest community in Australia," he said. "By working with a disadvantaged population in our community and helping them keep active and healthy in a safe and supervised situation, we hope to reduce fall-related injuries and quality of life in general. "The research may even reveal some answers about the impact of exercise for people with dementia." Starts at Goodna Aquatic Centre on Monday, February 17.